How to represent real world objects [RWOs] in the PHP OO code of Web applications by PHP objects? How and where to define and control hierarchical relations between different object classes? How and where to define the relation of the object properties to database table and column definitions of a RDBMS? How to define rules for presentation and web template controller objects and/or web generator objects ? As a common answer I often use a kind of "SCHEMA" oriented approach. By a SCHEMA on the programming level I understand a container of information that helps to control objects of an application and their properties in a flexible, yet standardized way. So, I am not talking about database schemata - I refer to SCHEMATA describing and controlling the data structure, the behavior, properties and certain methods of OO objects (OO Schemata). Such an object control SCHEMA may, however, refer to and use information coded in a relational database schema. Actually, important parts of a SCHEMA support the objectives of a classical data mapper pattern (OO properties vs. database table fields). But SCHEMATA in my own application framework contain more and other logical control information and settings than just data mapping definitions (see below). When many object relations and properties are involved the maintenance of multiple OO SCHEMATA may get painful. This article is about the idea that the use of decoupled Schemata for property groups and a rigorous use of composite patterns in the object design may make things easier. In the following text we call a PHP object instance that represents a RWO a "PWO". The PWO object properties are of course defined in the PWO class definition. What kinds of PWO classes are required is defined by the results of a object oriented analysis combined with an ER model. A specific PWO class may be derived from a general (framework) class defining "Single" [SGL] objects that shall work as PWOs (and represent a single RWO each) plus the methods required for handling a PWO and its property data. A PWO may represent a RWO of a certain type like a free position, a product, a contract, an employee or a web page. We need classes of PWOs to cover all required RWO types. For each class of PWOs that appear in a new PHP application I define a specific PHP SCHEMA object class (derived from Schema base classes). I use such a PWO Schema class to define - among other things - e.g. constraints regarding unique values within relations. Most of the property/field information is typically kept in arrays. The definitions can be provided directly in the class definition field or indirectly by fetching information from special database tables which an application designer may fill. Normally, only one Schema object instance - a PWO class specific SCHEMA object - is generated for each type of PWOs during the run time of a PHP application program. SCHEMA objects of a specific class are typical singletons. If you once have defined a Schema consistently with your database most - if not all - application features and methods to maintain the PWO objects and their underlying data should be ready to run. The object constructor uses the SCHEMA definitions to prepare and fill the objects properties. In addition a SCHEMA provides a very flexible and dynamic way to change the property list of object classes. As a central part of this task the Schema information relates (PHP) PWO object properties to database tables and their field/columns (of a RDBMS) in the sense of a "mapping". Such tasks are theoretically well covered by the use of "Data Mapper" patterns as a bridge between the OO and the RDBMS worlds. A SCHEMA is - among other things - a concrete Data Mapper object. It defines what PWO property corresponds to which database table column. (It may also define the property and data type, value limits changeability, and so on). If you for a moment neglect object relations (and related table relations in the database), in very many simple applications RWO properties and related PWO properties are mapped to the fields of exactly one database table. However, in case of complex applications you may also have to define parameters describing Master-Detail [MD] relations or other types of relations to other object classes or other external MD hierarchies. For complex applications we furthermore will add parameters defining which properties shall or shall not appear in which order, in which PWO single or PWO list representation, in MD views, in maintenance masks and so on. Especially list definitions (What fields appear? From which joined tables? In which order?) and definitions for which fields should appear in which order in maintenance masks or public web pages add complexity to a SCHEMA. Moreover, for the purposes of an application meta framework, I provide a lot of parameters to control presentation tasks both for automatically providing maintenance masks for whole object hierarchies and controlling the methods of web page generator objects. Therefore, in a complicated application environment, a SCHEMA object can be a very complex thing in itself - it must be modified with care and there should always be defined methods to guarantee consistency conditions - e.g. and of course between the SCHEMA definitions and the tables in the database. Note that SCHEMA definitions in application developer meta frameworks can also be used to generate tables for new applications (if they are not present yet) and/or to change existing tables and/or to validate the real database tables against what the PHP object representation in a program expects. A typical (web) application will of course require multiple distinct SCHEMATA for the definition of different PWO classes. If you make errors when maintaining the Schema definitions your application(s) probably will not run anymore. 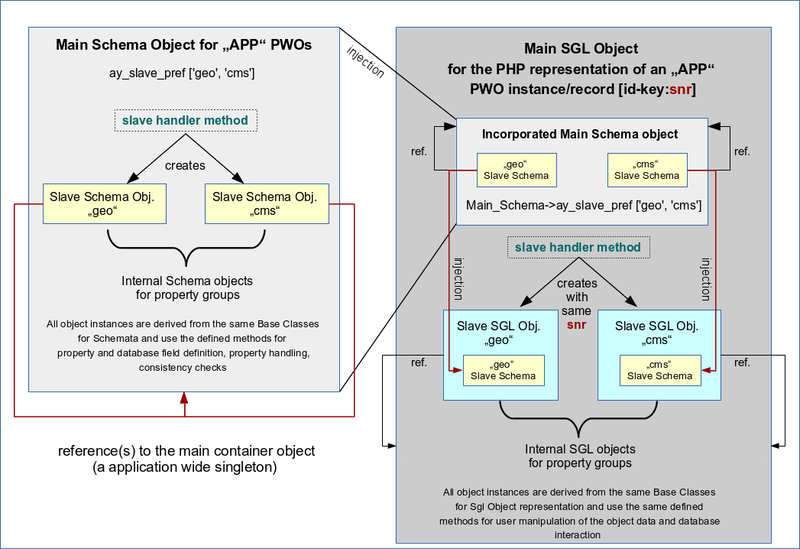 The reason of course is that Schema objects transport a substantial, crucial knowledge about the PWO object(s) and the database structure as well as object relations and table relations. This knowledge is used at many places in your application methods. Maintainability of SCHEMA definitions ? your application, object and and database design is finalized already. But, whenever the number of properties of RWOs/PWOs gets big, or large groups of logically connected properties appear and/or the relations to other objects get numerous and complicated then the effort to change the settings in the interconnected SCHEMATA for several PWO classes may get a painful and a very time consuming task. Especially the insertion of new object properties at some positions in defined sequence of properties may lead to a lot of manual adjustments a programmer may have to do in different affected Schemata. E.g., a renumbering of many array elements may happen. Changing the database tables may be much less of an effort than changing all affected Schemata in a complex application environment (to be developed). In parallel to the number of properties the number of columns in a database table may get big - so that even handling the tables with tools like phpMyAdmin may also become a bit difficult. Note that in a CMS like application the variables (properties) describing the position and look of page elements may easily be more than hundred. Typically, the last condition of my criteria list above will not be met during development phases - especially not in agile projects. Tests and new insights may lead to continuous modifications of data and object models. Resulting Schema adaptions to changes in database or object models may happen very often during some development phases. And then time is a more crucial factor than developers may wish it to be. Some SCHEMA edit actions like renumbering of arrays or adjusting property/field order definitions will feel like a waste of time especially in cases when only a special group of related properties is the main target of the changes whilst other property groups could be left alone - at least in principle - if things were decoupled ... . However, this is not the case if all properties of all property groups are sequentially listed and probably enumerated in one and the same SCHEMA object. And believe me - some enumeration has to be done - you cannot cover all and everything by associative arrays. To enhance the maintainability of SCHEMATA in vast MD applications I have used a different approach for some time now, which may also be of interest for other developers. Actually - as I am originally a physicist and programming is not even my main profession within IT - I am not sure whether the following approach has been described elsewhere. Probably it has. There is a big overlap with the well known general "Composite Pattern" in OO design - however, it is the relation to SCHEMA objects that is of interest here. My goal is to fold a composite pattern for SCHEMATA into a related composite pattern for PWOs. For myself it marked a bit of a change of how I incorporate structural information into complex PHP/MySQL applications like a CMS. I summarize my approach which leads to a split of tables and Schema definitions by the words "Slave Schemata and Slave Objects". By the word "SLAVE" I do not refer to Master-Detail relations. I neither refer to Master-Slave structures in a database or LDAP server environment. To mark the difference I shall below call the "master" of a SLAVE SCHEMA the "MAIN SCHEMA". Nevertheless SLAVEs mark a level in a new hierarchy of a composite pattern as I explain below. The first objective of this approach is to decouple the conventional definitions of property and data groups in a classical Schema class from each other and encapsulate each data group definition in a separate SCHEMA object, i.e. in a separate SLAVE SCHEMA class definition. The second objective is that - instead of comprising all data fields for object properties in just one database table - we will distribute the fields over several separate database tables - one for each group of properties. The third objective is to make the resulting MAIN/SLAVE-SCHEMA structure and the distribution of data over several tables usable for (restructured) PWOs - without having to reprogram basic methods already available to PWOs by inheritance from some Base classes (of a framework). This will lead us to the definition of SLAVE objects. Please note, that the rearrangement of data over several database tables is NOT done because of reasons like redundancy reduction or to get a better ER model. On the contrary, we shall need additional efforts in our object methods to gather all property information from separate tables. The whole effort is done to enhance the maintainability of our SCHEMATA. Nevertheless, reflecting the logical association of data groups by separate distinct tables may help to deal better with associative structures - although we even get a bit more redundancy. At its core a SCHEMA defines the relation between database table fields and PWO properties. If we want to split the properties of PWOs of a defined class into groups and distribute these groups into separate database tables we need of course multiple SCHEMATA and a related definition of several SCHEMA classes. and by some standard maintainable CMS parameters determining the presentation structure of text information and illustrating pictures on a web page (property group "cms"). Then we may identify two groups of properties "geo" and "cms" of such a PWO. We could define the properties and their mapping to database fields in 2 Schemata - one for the "geo" group of object properties and one for the "cms" group. Multiple SLAVE SCHEMATA - each describing a special group of semantically connected properties of its related specific PWO class. Note that we will define basic logical and fundamental relational aspects of a PWO in the MAIN SCHEMA. A SLAVE SCHEMA contains information about some standard properties confined in a group. Each SLAVE SCHEMA describes the relation of the properties of its associated group with the fields of a distinguished SLAVE database table - separate from the MAIN table and other SLAVE tables. All properties described in the MAIN SCHEMA object and it's included SLAVE SCHEMA objects together define a complete set of properties of a PWO instance. To logically bind associated records together it is clear that the key values identifying the associated records both in the Main table and the SLAVE tables must have a common value - identifying a PWO record and its respective object instance in a PHP program. We call this value of the unique record identification key "snr" below. The MAIN SCHEMA has of course to comprise some knowledge about the SLAVE Schemata. In an MD application, we may in addition have to define one MAIN Schema and several SLAVE Schemata on each of the MD levels. If you have to change some properties/fields - just and only change the affected SLAVE or the Main SCHEMA describing the related group of fields - but leave all other SCHEMATA and their definition statements unchanged ! The MAIN SCHEMA object - a Singleton - acts as a container object for its SLAVE SCHEMA object instances. It generates, contains and controls SLAVE SCHEMATA as sub-objects (i.e. as complicated variables). We can save this knowledge in array-like structures for the sub-objects. The SLAVE Schemata can e.g be arranged in an associative array with indices defined in an array "ay_slave_prefs" of the Main Schema - containing name prefixes for each of the (Slave) property groups (e.g. "geo" and "cms"). The MAIN SCHEMA objects of an MD application and their encapsulated SLAVE SCHEMA objects should of course be instances of the same type of general Base Classes for Schema objects. We want to use as much of the methods already defined for Schema objects as possible. SLAVE Schemata are basically Schemata after all! Nevertheless, in such an approach we would still have to adapt or introduce some methods to deal with the hierarchical structure and the association with another - e.g. in special requirements for consistency checks between a SLAVE Schema and its MAIN Schema and other things. However, this is an easy task. Furthermore, each SLAVE SCHEMA object should to receive a reference to its MAIN SCHEMA object as an injected parameter to be able to create and handle further references to all the variables of the MAIN Schema. So the MAIN Schema object will contain SLAVE Schema objects - each of which itself comprises a reference to their common container object, namely the MAIN SCHEMA object. Note, that there is still only one MAIN SCHEMA object comprising all relevant property and relation information for each PWO class. Ok, so far we grasped the idea of a kind of an array of SLAVE Schemata within a MAIN SCHEMA. Each SLAVE SCHEMA describes a bunch of properties of a PWO object class. The values of these properties are saved in a distinct database table. The MAIN SCHEMA keeps everything together and defines also the MD relations and other relations of a PWOs of different PWO classes. At the core of PHP (web) applications, however, we need (structured) PWO objects with methods to handle all of the user's interactions with all property data. In my application meta framework a PWO class is realized by deriving it from a base class for so called Single [SGL] objects. The task of a SGL object class is to provide a general basis for specific PWO classes. A PWO instance is also a SGL instance and has all of its methods available. We speak of a "SGL PWO" object below. (An application class family comprises also other types of objects as e.g. LIST objects or template control objects). A SGL PWO object is derived from some SGL Base Classes (of an inheritance chain) with all required methods e.g. to handle database transactions, to check field contents and to handle complex object relations like MD hierarchy relations of a potential PWO. It does this by extensively using the PWO SCHEMA information in its methods. Do we need to rewrite all the base class methods for SGL PWOs to handle the database interactions because we have divided the PWO properties into distinct groups (saved in distinct database tables). Fortunately, the answer is NO! A SGL PWO object in my framework e.g. identifies its appropriate SCHEMA object by following name space rules and then loads the Schema as a sub object (see the graphics). It does this by injecting the PWO Schema object into the constructor of its most elementary base class in the inheritance chain. So, basically a PWO gets its Schema object injected. (I have only automatized this process by name rules and the use of Singleton patterns). A PWO deals with its data by using the knowledge of its injected SCHEMA. The properties of each SLAVE SGL object correspond to fields of the table/views defined in the related SLAVE Schema, only! To use that on the programming stage we only have to create the SLAVE SGL PWO objects the same way as the MAIN SGL PWO object - BUT with an injection of the relevant SLAVE Schema instead of the Main Schema! See the drawing above. As in the case of the SCHEMATA we create each SLAVE SGL object with a reference to its MAIN SGL object. Each SLAVE SGL object therefore knows about the identification key of the MAIN SGL object (and its rows in the database tables) and can therefore use it to identify its own records in the SLAVE tables of the database (defined in the SLAVE Schema). Remember that we defined the key value to be the same for associated records in the MAIN and SLAVE tables. Provided that the right SLAVE SCHEMA was injected into each SLAVE SGL PWO , all base class methods that work for the MAIN SGL object regarding database operations will also work for SLAVE SGL objects. The correct identification of the right record in the associated SLAVE tables is guaranteed if each SLAVE object gets the same value "snr" for its identification key as its MAIN container object (see above). That should be straightforward to understand and can be guaranteed by the constructor functions. As a result SLAVE objects and their methods work autonomously on their SLAVE tables just as the MAIN SGL object works on its main table. If SLAVE objects exist call the method presently used for the MAIN SGL PWO object for each of the SLAVE objects, too. For error handling we need further method extensions controlling the success of the database operations over all (MAIN and SLAVE) tables. In case of failures in a SLAVE table all other already performed transactions on other SAVE tables or the MAIN table have to be rolled back. To do this without appropriate mechanisms offered by the database the old values have to be saved in an intermediate storage. Otherwise database transaction control and rollback mechanisms could be used. Hide or use the SLAVE structure from outside? or to create interface methods that hide the internal structure. My experience is that in case you build your own application development framework you will need both approaches. Note also that our SLAVE approach will have an impact on objects and methods developed for representing LISTs of PWOs or MD views over several MD hierarchy levels of PWOs. But that is stuff for another article. In this article I just wanted to present the basics of the SLAVE SCHEMA and SLAVE PWO object approach. Maintaining multiple SCHEMA definitions over hundreds of properties of RWO/PWOs can be dreadful. Splitting the properties into property groups and defining associated Sub-Schema-objects of a Main-Schema-object in the sense of a OO composite pattern can help to improve maintainability. This approach can be coupled with a composite pattern for the (SGL) PWO objects representing single RWOs. The SLAVE (SGL) PWO objects will be instantiated by using the same SGL base classes as for the MAIN PWO object (containing the SLAVE PWOs). The decoupling of data is guaranteed by the injection of right SLAVE Schema into a SLAVE PWO. Many methods can then be iterated over the Main/SLAVE objects and will then lead to a consistent database interaction. MySQL/PHP: LOAD DATA – import of large csv files – linearity with record number? I talked a little about my first positive experience with using the "LOAD DATA INFILE ..." SQL statement in PHP programs to load csv files with millions of records. Some reader asked me whether the import period behaves linearly with the number of records. Actually, I am not completely sure. The reader has to wait for some more experiments on my side. Right now we are preparing tests for 1, 2, 5 and 10 million line csv files for a certain project I am involved in. For 1 million records we needed ca. 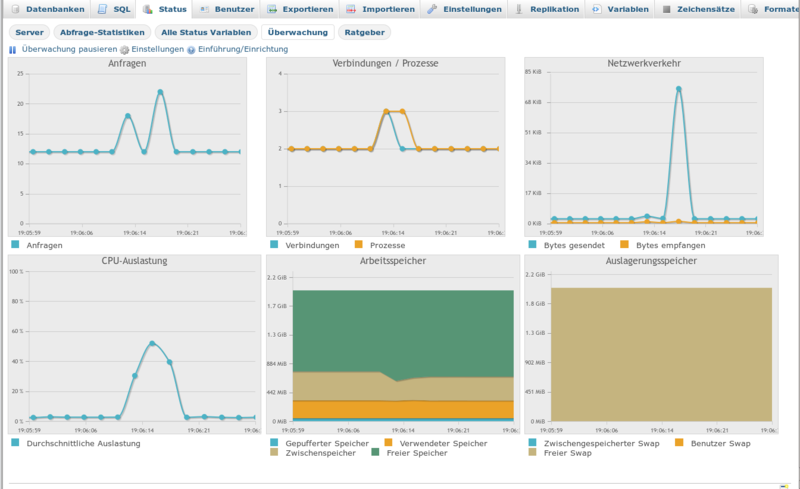 7,5 seconds to import them into a MySQL MyISAM table (with index building). For 2 million records we needed ca. 15 seconds. For 5 million records we needed ca. 38 seconds. The csv data files were originally 32 MB, 64 MB and 165 MB big. We transferred them as compressed zip-files to the server (size reduction by a factor of 4 in our case). You can see the two fold SELECT structure resulting form the action sequence described above. Please, note the systematic rise of intermediately used memory from around 700 MByte up to 1.3 GByte! I conclude that the linear behavior is valid only as long as the system has enough free RAM to deal with the data. In one of my present projects there is a requirement to upload tens of millions of records from several csv files into a database. The files are uploaded to the server with the help of Ajax controlled browser/server-transactions. On the server the file contents should be checked and then transferred into an appropriate database table. In my case a MyISAM table. 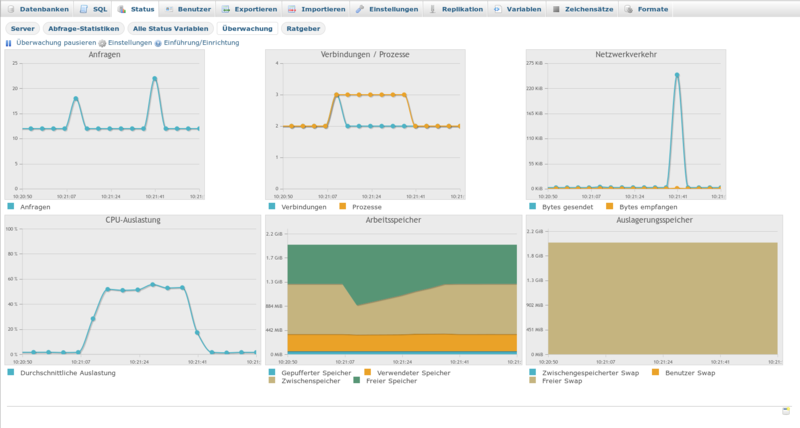 This is the first time that I had to deal with such big record numbers on a MySQL database. On an Oracle databases I worked with around 30 million record tables some years ago - but those data came from other sources and were supplied more continuously than in form of a one step csv file import. Although the data structure and table structures for the import are flat the pure amount of data makes it necessary to think a little about the way of transferring them from file lines to records of a MySQL database table with the help of a PHP server program. Below, I really do not present fundamentally new insights - a MySQL expert will not find anything new. But maybe others who for the first time stumble into a big data import problem may find some of the hints below useful. the processing of a sequence of one INSERT SQL command for each of the file lines. Reasons for such an approach were: You have complete control about the data and the import process. You may check the contents of each file line thoroughly already before inserting it. You may send intermediate positive or negative messages to the client via Ajax, etc..
one INSERT for each line with parallel index building for each of the three integer columns. That really meant trouble for my rather impatient customer. The extrapolated time for the import of similar contents of 8 additional files and a potential factor of 50 with respect to the final number of file lines/records made him nervous. And he was also aware of the fact that due to index building the total required import time may grow faster than linear with record number. So, one thing you could try is to put the result of several fgetcsv() calls into one INSERT statement. In a next step you would try to find an optimum number of records per INSERT by systematic testing. This may already give you a substantial acceleration factor. Improvement 2: Use "LOAD DATA INFILE ... "
A relative factor of 18 is impressive. However, the usage of an optimized loop like program taking and saving (probably bunches of record data) also may have disadvantages. One question is: How are data with wrong field numbers or wrong data type formats handled? One can imagine that there might be a policy that the program cannot stop because of one defect in one line. The error handling would depend on a reasonable summary of which file lines/records were defect. We come back to this point below. I have not tried or investigated this yet; so, I can neither give a general impression of this recipe nor an acceleration factor. But I consider it worth trying when I find the time. Maybe after the first 10 million record import 🙂 . I can now confirm that separating the index creation from the loading process with "LOAD DATA INFILE" may give you another significant factor. This is especially true when unique indices are built in parallel to the data loading. Already omitting a simple auto-incremented unique index over one column may give you a factor of around 2. See a forthcoming article for more details. In my case we have to import 2 groups of data for N different quantities with the same key dependency - in our case 2 groups with 4 different quantities, each. Due to the requirements of using these data independently in different calculation steps, it seemed to be wise in a first approach to load all these quantities into different tables despite the very same key structure and key dependency (in our case on integer triples describing a 3-dimensional finite numerical grid structure). To deliver data for one and the same key combination in one combined file is also a matter of transfer efficiency to the server as the total amount of data to be transferred via the network/Internet gets less. It is not necessary to change your programming statements for calculations with data taken from separate tables if you work with appropriate views of the combined table that "simulate" such separate tables for you. In my case views of the type "MERGE" were appropriate. 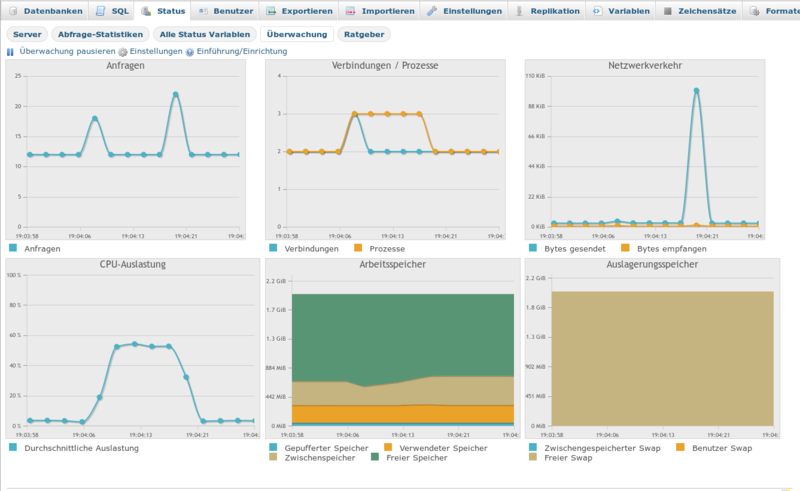 I could not see any significant performance reductions when using views instead of tables. Regarding csv import the most important effect is that you instead of N times importing a file of the same structure you only import data from one file. That reduces the amount of INSERTs by a factor of N. The question remains how that relates to the fact the each INSERT writes more columns of the import table in the database. For a million records the import time did not change very much in comparison to the time of 6 seconds required for importing a file for just one quantity - actually the difference for loading our file for 4 quantities was below 10%. That means that in our case we gained an additional factor of almost 4 for shortening the total required import time. So, by using "LOAD DATA INFILE" AND combining data quantities with the same key depency in just one file I could reduce the total loading time for 4 files with each a million records by a factor of around 70. $sql_load = 	" LOAD DATA INFILE '" . $this->imp_file . "'" .
" INTO TABLE " . $this->tbl_name .
" FIELDS TERMINATED BY " . "';'" . // " LINES TERMINTED BY " . "\r\n" . (You may need the commented line in case of files generated on Windows). Or you may even use "Show Warnings". An explicit look at the existence of errors or warnings is also helpful if the whole import is part of an Ajax transaction and you want send appropriate error messages to the client in case of detected errors during the "LOAD DATA .." process. This leads us to the next point. What about the requested checks of the data ? For all network nodes (described by tupels of integer key numbers): Are there equal numbers of records in the third key dimension (in our case time) for all nodes? Other checks may, however, directly concern the quality and type consistency of the input data. So, what happens, if "LOAD DATA ..." stumbles across a line with missing fields or a wrong type of data (compared to the database table column definitions) ? Tn the documentation http://dev.mysql.com/doc/refman/5.1/en/load-data.html it is described what e.g. happens if a line has insufficient fields or too many fields. Automatic type conversions are probably tried, when the type of a field value does not fit. I have not yet tested what really and exactly happens in such error cases. The official documentation is not at all clear to me regarding this point. It seems to be reasonable to assume that an automatic routine for the import of csv data lines would try anything to get a line into the database table. So, I would expect a standard procedure to compensate missing or too many fields and trying some automatic type conversions before a line is skipped. I would not relly expect that a faulty line will lead to a direct stop of the import process. Warnings occur under the same circumstances as when values are inserted using the INSERT statement (see Section 13.2.5, “INSERT Syntax”), except that LOAD DATA INFILE also generates warnings when there are too few or too many fields in the input row. You can use SHOW WARNINGS to get a list of the first max_error_count warnings as information about what went wrong. See Section 13.7.5.42, “SHOW WARNINGS Syntax”. However, the stupid thing is that you still may not get the relevant information (What record was wrong? What field had wrong values ? ) from this when the INSERT eventually worked. What we really would need is something like a bad record log. So, right now it seems to me that the impressive reductions of load times when using "LOAD DATA INFILE ..." also does have its drawbacks and disadvantages. Therefore, I am thinking about precursor programs that would open the file and analyze the contents of each line before "LOAD DATA" is afterwards used on the whole file. The overhead for such precursor programs must of course be evaluated by tests. When I have gotten more experience with "LOAD DATA" I will come back to this point in this blog. Using an SQL statement with "LOAD DATA INFILE ..." will reduce the time to import flat CSV data into a corresponding database table significantly by factors of around 18 in comparison to standard methods based on INSERTS per file line. The official MySQL documentation promises a bit more - but the factor measured for a real world example is still impressive. A disadvantage of the "LOAD DATA .." statement from my point of view is that the handling of errors in a PHP program remains unclear. Nevertheless, for the time being I still would recommend the usage of "LOAD DATA INFILE ..." in PHP programs for uploading csv files - if the performance of a csv import is a dominant objective in your project.